Congress and the Obama Administration are aggressively pursuing energy efficiency, renewable energy, pollution reduction, and energy independence. One element of the Administration’s environmental plan is called “cap and trade,” a policy approach for controlling large amounts of emissions from a group of sources. While proponents point to the public health benefits and environmental protections of emissions control, critics voice concerns about possible effects cap and trade could have on the investment the federal government is making to stimulate the economy. The trade: Some companies will find it easier than others to reduce pollution levels. Companies whose pollution levels fall below the cap can sell their pollution credits to other companies directly or trade credits through a pollution credit trading house. The profits: The federal government could auction CO2 credits and take a fee, or issue CO2 permits and sell or give them to firms with historically or projected low pollution emissions. Regulate GHGs from power plants and other industrial facilities. Require electricity utilities to purchase renewable energy (a national portfolio standard) or buy renewable energy credits (RECs). Six percent of the power must be from renewable sources by 2012 and 20 percent from renewable sources by the year 2020. Require major companies to track and report on their energy use and related emissions. Create the Clean Energy Deployment Administration to provide loans and loan guarantees to spur more private investment in energy technology. Authorize the U.S. Department of Energy (DOE) to issue loans of up to $25 billion to the auto industry under the Advanced Technology Vehicle Manufacturing Loan Program. Hold an emission credit auction four times per year with projected revenues of $973 billion over the 2010–2019 period. Issue $3,500 to $4,500 vouchers for consumers to use in purchasing more fuel-efficient vehicles. Create a program to compensate U.S. workers who lose their jobs due to cap and trade. The federal government would pay 70 percent of their pay for up to 3 years and would cover 80 percent of their health insurance costs. Create energy efficiency programs costing $6.7 billion over the 2010–2019 period ($3.1 billion for lighting, $2.1 billion for energy efficiency in buildings, $1.5 billion for energy efficiency for industry and certain state and local government buildings). Enforce civil penalties for non-compliance. The Waxman-Markey bill calls for an increase in federal revenues by $846 billion over the 2010?2019 period, with $821 billion in direct spending, a reduction in future deficits of $24 billion, and an increase in discretionary spending of $50 billion. Increased administrative costs to the Environmental Protection Agency for 2010 are estimated to be $40 million, with total costs for 2010?2019 of an additional $8.9 billion. Administrative costs to the Federal Energy Regulatory Commission are estimated to be $7.9 billion over the same period—an average annual cost increase of $878 million per year. Estimates on the cost of the bill for the average household vary widely, from as low as $98 per year to as high as $3,000. What would an energy cost increase mean to your company and its customers? 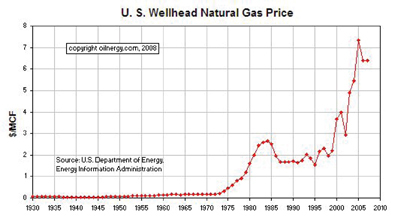 One example: an increase of $1.60 per Dth of natural gas might be absorbed due to the downturn in natural gas prices in 2009. While there are no guarantees on natural gas commodity prices, natural gas prices likely will return to traditional levels as the economy improves (see figures 1 and 2). Companies need to be able to predict their costs to intelligently price their products and services—which means considering the costs if natural gas prices return to their previous levels. Europe has been implementing cap and trade programs for years with mixed results. The theory is that a market will develop for CO2 credits, with the value of the credit driven by the market. 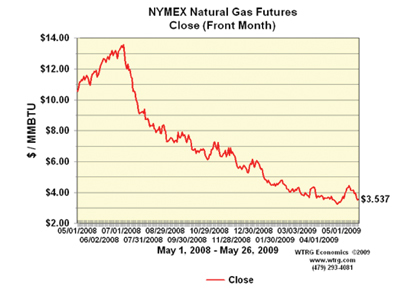 For example, in July 2008, a CO2 unit in Europe was being sold for 29.33 euros. Four months later, the CO2 credit price was 18.25 euros. In the United States, RECs can be purchased to subsidize renewable energy projects that often have poor returns on investment without RECs. If a company cannot reduce its energy consumption and carbon footprint, the company can purchase RECs from a certified renewable energy producer. Currently, the supply and demand challenge is that only 7 percent of the energy market qualifies as green/renewable. Wind energy has grown dramatically in recent years, but solar photovoltaic energy has been slow to be adopted due to its longer payback period. Most states have “portfolio standards” for electric generation companies. These states have goals—some have requirements—to obtain 10 to 25 percent of electricity production from renewable energy. Because wind energy has been commercialized in some states, this becomes a ready market for electricity generation providers to meet their obligations. There has been some discussion of making this portfolio standard a federal standard, providing uniform access across all states and electric utilities companies. Some proponents of CO2 reduction want to give credits for all energy conservation projects, asserting that energy management projects would have higher return on investment (ROI) due to energy savings, demand-side management rebates, plus energy credit for pollution reduction. Under such a system, every insulation project could create a tradable energy credit. Of course, someone needs to certify the energy savings and, therefore, the credit. The Energy Policy Act (EPACT) of 2005 provides an immediate expense election for energy projects that reduce a building’s energy consumption at least 16 2/3 percent below the ASHRAE 90.1-2001 edition. The election—under section 179 D—must be supported by certification from a registered professional engineer or a contractor licensed to work in the jurisdiction. Lighting retrofits are relatively easy to certify since the Internal Revenue Service (IRS) issued interim rules: the lighting EPACT opportunity is $0.30 to $0.60 per square foot. The balance of a building can be worth up to $1 per square foot, for a total of $1.80 per square foot. Non-lighting projects require building energy modeling using one of the IRS-approved energy modeling software programs. Higher energy prices push American businesses and consumers to focus on energy conservation, including the oldest energy conservation measure: insulation. A recent National Insulation Association (NIA) effort with the Oak Ridge National Laboratory and the DOE helped quantify the value of additional insulation in large and medium-sized industrial plants. Proper levels and types of insulation in plants could save $1.9 billion in annual energy savings and create 12,000 green jobs. NIA has estimated that the energy savings for the power/utility sector beyond the ASHRAE 90.1-2007 energy standard for process piping and HVAC could yield an additional $2.3 billion in annual energy savings and equal 15 million metric tons of CO2 reduction. All the energy savings from additional insulation identified was estimated to produce $4.8 billion in annual energy savings and 89,000 green jobs for the United States. Proponents of cap and trade believe higher energy prices will reduce energy consumption and pollution, while critics think cap and trade will impose an unfair burden on consumers. In any event, the concept—with the Waxman-Markey bill—is broadening the dialog.